A few weeks ago I had the privilege of being able to connect with a tiny home owner through a comment she left on one of my blog posts – the internet is amazing, friends! I have been so fascinated by the concept of tiny living lately and how people are able to take that leap to live such a simplified life. 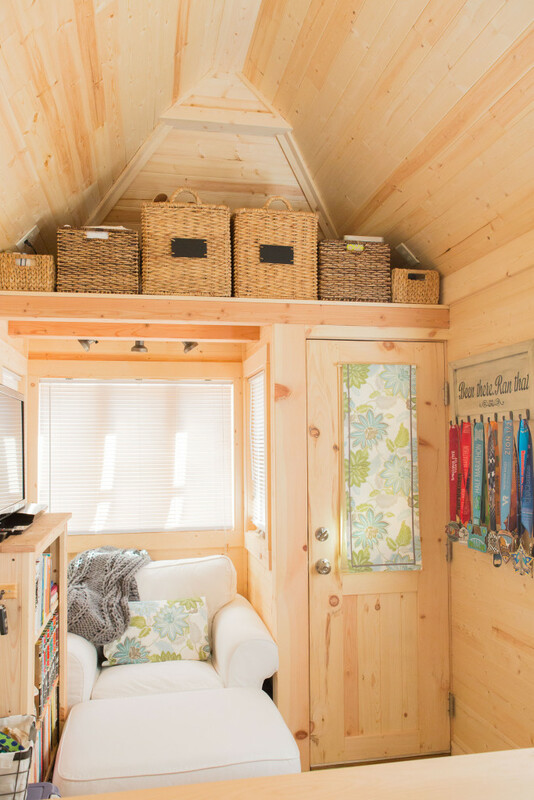 I had the awesome opportunity to interview the fabulous Lora at The Tiny House Teacher, who lives in an absolutely adorable 234 square foot tiny home (pictured above) with her dog Rocket. She is truly an inspiration to me, and I think that you will really love the wisdom and experience from tiny living and downsizing her life that she has to share. I hope you enjoy her passion and advice as much as I did! Why did you decide to move into a tiny house? I think one of the questions that people ask me the most is, “why did you decide to move into a Tiny House?” I have to say, it was a complex decision that required a lot of self-reflection and planning. About a year ago, I found myself in a job that wasn’t very fulfilling, and that was relatively toxic for me. I knew I wasn’t really enjoying life, but I wasn’t sure what needed to change to make it better. I started really thinking about what I wanted my dream life to look like, and I realized I wanted more freedom, less stress and a lot less debt. Once I determined what I wanted, I started looking for ways to achieve those goals. Then I picked up a copy of Tammy Strobel’s book, You Can Buy Happiness (and It’s Cheap) on a business trip. In her book, Tammy described the journey she and her husband took to simplify their life, reduce debt and live more intentionally. It involved them moving a number of times over a couple of years and eventually ending up in a Tiny House. Originally I thought a Tiny House was crazy! It was such a different lifestyle, that I had a hard time thinking about what it would look like for me. But the more I thought about it, the more I realized living in a Tiny House would allow me to live a life that reflected my values and goals. I saw a Tiny House as a way to be more intentional with how I was living my life. I wanted to slow down and spend less. I wanted the freedom to move more if I wanted to, and mostly I just wanted to get to a point where I didn’t have to work full-time in a job that I no longer enjoyed. My Tiny House is helping me reach my goals and has opened up opportunities I never expected. A lot of people wonder why I didn’t just move into an RV, but for me a Tiny House felt a lot more like home. I didn’t want to feel like I was in a temporary living situation when I moved, and my Tiny House allowed me to really create a space that had everything I needed and reflected my personal style. I absolutely love it! How was the process of downsizing all of your possessions to fit into your tiny house? What were some of the most difficult things to pare down? It was easy for me to analyze and organize what I had, and it was easy to eliminate some of the stuff. 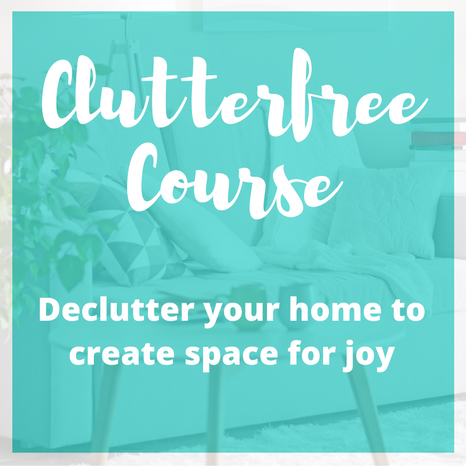 It was simple to get rid of the extra office supplies, and it wasn’t too taxing to clean out the junk drawer or the extra sets of sheets for a guest room I was no longer going to have. But downsizing was still challenging. It stretched me in ways I hadn’t been stretched before. It required me to really analyze what had value to me and why. It also required me to take a long look at the things I had accumulated over the years, and decide which things still fit who I was and who I wanted to be. It took a lot of energy for me to analyze how I used my space in my old townhouse and to understand what “things” made my house feel like a home. It took even more energy to unload the things I knew no longer added value to my life. I spent three months unloading more than 80% of what I owned. At times it was incredibly challenging, but I reminded myself that every load I donated or sold allowed me to get a little closer to the life I really wanted to live. The hardest things for me to part with were my books. I had 5 full bookcases of books in my house prior to my move. I now have one bookcase (that I had specially designed to fit in my Tiny House). For me, books represented who I was, and the idea of parting with them was tricky. But what I realized, was that it was experiences and memories that gave the books meaning to me. Once I was able to separate my attachment to the object with the idea of the object, things got a lot easier. What have been the biggest benefits of tiny living? Tiny Living allowed me to change jobs, move across the country and simplify my life. It allowed me to unload possessions that no longer added value to my life, and encouraged me to really decide what was important to me. I think the biggest benefits for me so far are fewer expenses and more free time. Tiny Living has helped me save money in terms of the amount I spend on my household bills, like a mortgage and utilities. It has also encouraged me to shop less and save more. Since I moved into my Tiny House I have started my own business, reduced my debt and generally started enjoying life more. Tiny Living has also encouraged me to pursue experiences rather than the collection of things. Although I am certainly not a minimalist at heart, I still have way too many books and dishes to qualify, I spend a lot more time doing things than buying things. A small space encourages you to get outside and it allows you to travel more because it takes less time and money to maintain. 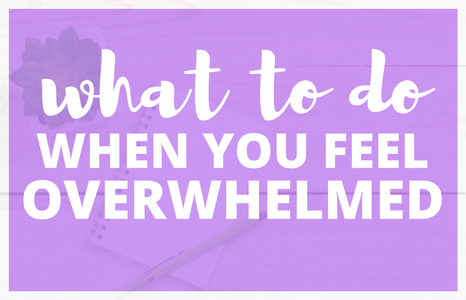 I am constantly amazed at how simplifying my daily routine and my living space has encouraged me to grow as a person in ways I wasn’t expecting. What advice do you have for someone who wants to live a more simplified and downsized life, but isn’t quite ready for tiny house living? I think simplifying is about aligning your time and money to your values and goals. A lot of us got on the work-to-spend treadmill without really analyzing why. We live in a culture that encourages consumption and promotes the idea that working more will allow us to buy more, which will ultimately bring us happiness. Or at least that’s sort of what the “American Dream” promised. I certainly don’t think everyone belongs in a Tiny House, for some it simply wouldn’t fit their family or their lifestyle, but I do think there are lessons to learn. However, before you can decide what you need to simplify, you first must understand what you want your dream life to look like. I think we often forget to really stop and think about why we are doing the things we do or why we are buying the things we buy. We do most of these things on auto-pilot, not because we are bad people or lazy, but simply because it’s what we have always done. The first step to simplifying is deciding which people make your life better, figuring out what stuff adds value to your life, and making a conscious choice about which activities you want to pursue. Understanding what’s important in life can go a long way in helping us simplify. Because most of us have to trade time for money to at least some degree, the first big step to simplifying can be reducing expenses and eliminating debt. For most of us, eliminating debt reduces stress. It can also help you cut back on how much you “have to work” to maintain your lifestyle, if that’s a goal. In other cases, reducing debt can increase the amount of money you have for travel or for experiences that add value to your life. Just remember it is almost always easier to reduce how much we spend than it is to increase how much we make. I also encourage people to simplify their things. Most of us are collectors by nature, at least to a certain extent. Letting go of the things we no longer use or want allows us to not only reduce the amount of stuff we have to maintain and care for, but it can also be a blessing for someone else. Aligning our time and money to the people and things we value most is probably the quickest way to simplify your life. It requires work and there are almost always trade-offs, but it is a lesson that can be applied no matter what size house you live in. Lora Higgins is the author and owner at The Tiny House Teacher, helping others pursue their Tiny House Dreams and build lives full of meaning and free of excess. 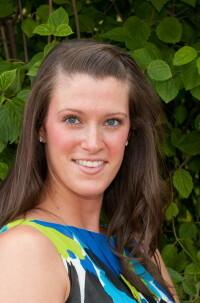 She loves reading, triathlons and ballroom dancing. She is also the author of Dream Big, Live Small, available on Amazon. What are your thoughts on living in a tiny home? Do you think you would be able to downsize your possessions to the extent that Lora did? I too love a simple life and have attempted it to some degree. There must be enough income for dental and medical insurance and emergencies. Yearly earning amounts will affect retirement and Social Securites benefits that will be your income when you no longer working. Leaving the workforce early to presume thus lifestyle has had a major impact on retirement and without dental insurance and a broken tooth….well, it’s a problem. Starting a tutoring service (as I have) or small house teacher mentor program (as you have) just seems to make me owe more in taxes. I have dreams of a simple, spiritual life, and as a high achiever, let’s do something to better the world goals that are conflicting. Plus, my only family( daughter) is across the county and if I want to see her, I need air fare. Any thought on the resolution of these issues? Or recommended reading about them? You bring up some great questions! I am a firm believer in planning for the future and making sure I have appropriate insurance, so thanks for asking about that and retirement. Right now I am still working full-time and running my own business, so I haven’t had to worry about insurance coverage yet. I have simplified, but I am not out of the workforce. I am working hard now, and reducing expenses so I can save more and will have a cushion for retirement when I get there. I am also trying to build up my business and other forms of additional income, such as a rental properties (my previous townhouse I owned), to help me make sure I have enough income for living expenses in the future. I also realize that a “comfortable retirement” may involve me working somewhere at least part time in the future to keep a steady income and access to insurance (plus I get bored too easily to quit working completely). I think you have to analyze your goals and the level of “risk” you are willing to accept as an individual when it comes to insurance options and retirement income. As far as travel goes, I have signed up for various fare watch programs. If you have flexibility about when you travel, you can get some great deals. If you join a rewards program and fly the same airline, you can also earn points to travel for less in the future. I think it goes back to knowing what your goals are, and what your priorities are in your life. I hope that helped. Oh, I wasn’t questioning you I was just mentioning some issues I had come across and I was asking your advice for me! That being said, it sounds like you have thought everything through and are on track. We read from our own perspective I envisioned you not working at a regular job and pursuing a personal goal…perhaps training for a Trialthon or something. When I read your response, now I get the impression, that you are gutting expenses, investing, working etc. as smart ways to increase earnings, reduce expenses, and achieve some financial reserves and freedom ! Hi again! Unfortunately, I don’t have an specific books about insurance issues. I just published my first book, Dream Big, Live Small on Amazon that is about intentional living and downsizing. I loved Tammy Strobel’s book, “You can buy Happiness (and it’s cheap)”. From a financial planning perspective, I love all of David Bach’s books, particularly “Start Late, Finish Rich”, and “Smart Women Finish Rich.” I will also be adding a long list of my favorite books/resources on my website in the next week! Great interview! I’ve always been fascinated with hearing about people who live in a tiny house since I watched a documentary about it last year. It just seems like such an escape from the social norm that tells you that you have to work until your mid sixties, have a mortgage, and spend your whole life paying off debt and living paycheck to paycheck. The only issue with me living in a tiny house is that I have a child and kids like to run around and need space. But overall, I don’t think I need a ton of space and want my house to be modest and my possessions to be limited. Choice thanks for checking out my interview! I think my favorite thing about my new lifestyle is being more intentional about what I spend my time and money doing. I know if I get married and have kids someday that a Tiny House might not really work. Although, I do find I spend more time outside, so maybe it would work. The best thing is I know that I will apply my new life philosophy (align time and money with my goals and values) to my future home no matter what size. And sorry that autocorrected your name! Thanks, sounds interesting and I will check them out! Thanks, this was fascinating! I am also a single woman with tiny house fantasies; I keep getting tripped up when I start to think seriously about by two issues: 1) adequate space for cooking, pot/pan, and food storage; and 2) enough living room space that when you sit with a couple of friends you don’t feel like you’re staring right at a wall two feet from you 🙂 A lot of tiny house designs I’ve seen don’t have space for comfortable seating — a thin cushion on a storage bench seems like what most people have — and I’m trying to figure out how to design a space that feels more generous. Maybe the answer is not trying for a trailer-size — a house with the same square footage, but which is not long and narrow, might feel better to me. I never liked living in rowhouses either! You bring up some great points! I have an L shaped kitchen, so I have been able to maintain a decent sized (all relative in 234 square feet) kitchen, and room for all my lots and pans. I have a few pictures on my website so you can see my kitchen layout. As far as seating goes, I agree a bench seat with a thin cushion was not what I wanted! I have an ottoman that can be moved for extra seating and two directors chairs I can bring in, but it is tight. I usually “entertain” outside. I love the fact that you know what space would work for you! Keep Dreaming BIG! P.S. meant to say: your reading nook looks fabulous. It’s really nice to see that comfortable chair that I can actually picture sitting in for several hours. I definitely like having space. Then again, I work from home all and have a husband who’s home all day, plus we don’t go out much since I have chronic fatigue. Even 700 square feet felt almost cramped because of that. But I do know something about simplifying. When we moved from Seattle to Arizona we were still in debt, and we weren’t sure if my husband’s unemployment would be extended. So we needed the cheapest route possible while still keeping things that would cost too much to replace, like our memory foam mattress. We chose a u-pack cube, which was 7’x8’x9′. We kept a couple things in the car, like some clothes and a small TV. Otherwise, everything had to fit in the cube, including a mattress, a couch, two dressers, etc. Suddenly, a lot of things seemed awfully extraneous. Wow Abigal, I applaud your simplifying adventure. It is true that so much can seem extraneous when we really start analyzing what we need vs what we want. I am not a fanatical minimalist and I saved a lot of “extra” stuff that my house fee like a home, but downsizing helped me understand the things that actually added value to my life. 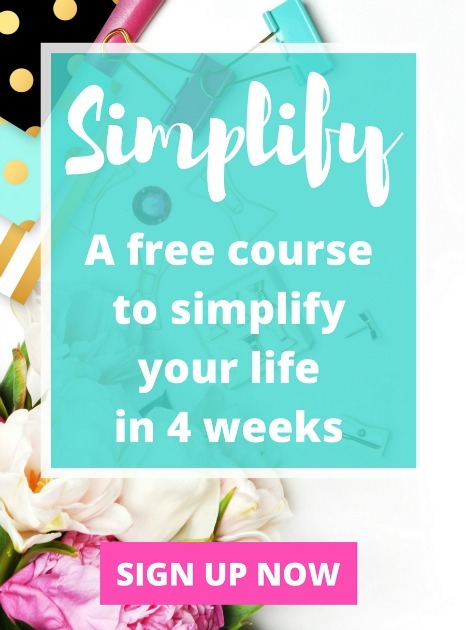 Congrats on making simplifying work for you and your husband. Kay, thanks for sharing! I am thinking about using my Tiny House as a travelling tool (like an RV) in the future. The idea of moving around is so exciting and liberating. I am in the pay off debt, simplify and build my business phase of my adventure, but ine day, I will join you on the road! And thanks for sharing my blog with your friend. 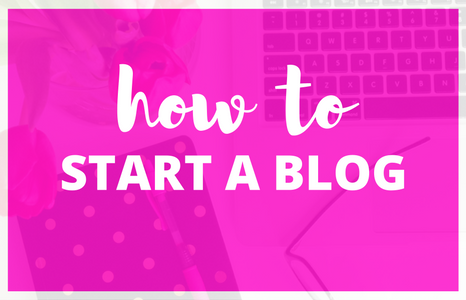 I would love to check out your friend’s blog if you are comfortable sharing her site with me. Thanks Kay, I will check it out! I would love tiny house living! My brother has a tiny home on his farm that we were able to check out and it seemed very doable. Well, doable once the kids are on their own;0) I don’t think we could do it as a family of four. It would be awesome if there were tiny home communities or even tiny home communities where people could try it out to see if they could do it. Hey Jayleen! I just got back from the Tiny House Conference in Portland and there were a number of people in the process of starting Tiny House communities, so stay tuned! Hi Lisa! I think as tiny houses continue to gain popularity, we will see more “empty nesters” trying it out. I have to say, simple is amazing! I just posted an article about the simplicity of spring cleaning in a tiny house, it’s a silly example, but one that highlights how much time I save by having a smaller space and fewer “household” responsibilities. I think “right-sizing” is going to become huge as we move away from an over consumption culture. Good luck to you! Really great story! I think it’s easy to get wrapped up in the whole “I want a house that has it all!” mentality. I know I sometimes dream of leaving my *small* rambler for a bigger house with an en suite, walk-in closet, etc. but really I have plenty of space in my house right now and there’s no reason to move at this point. I think it’s great the impact that tiny houses have had on the way people think about what they truly need. Even if you don’t move to a tiny house (I currently do not plan to), it forces you to rethink your current and future housing plans and think about what you REALLY need. I mean, if we can make our house work 10 years longer than we planned on that’s 10 years avoiding “upgrading” and potentially a much healthier financial future. I’m now looking to make my house work for what we want out of a home versus thinking of what we could have if we upgraded. Such an interesting article! I could see myself enjoying tiny house living at some point later in life (assuming my husband would be on board!). I’m fascinated by the concept. We downsized late last year from a home into an apartment roughly half the size, and the apartment is plenty of space for us and much easier to clean and maintain. I checked out your tiny home photos on your blog, Lori, and it looks like a wonderfully well designed and organized space. Love it. Thanks for sharing your story! 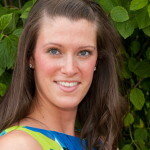 Jennifer thanks so much for visiting my blog and congrats on your downsizing journey! It does get a tad trickier to have two people on board with living in a Tiny House, although there are a number of couples who have made that leap. We will see if my future guy is on board :). I have enjoyed the change, but know it isn’t right for everyone. Stay in touch and let me know if and when you decide to go Tiny! Thanks Carla! I have to say, I do love my reading nook. 🙂 And I have to agree, 6 might be tricky! I think one thing I love the most about tiny houses is you can, in theory, have them anywhere. Our house is currently incredibly cheap – a big(ish) house but cheap mortgage, cheap to keep cool/warm, cheap water/gas bills… the problem? It’s in an incredibly UNSAFE part of town. As in, homeless people in our backyard, breaking into our house. Unfortunately, living in a nicer part of town means everything goes up: mortgage, water/gas/electricity, etc. Even if our water/gas stayed the same, our mortgage would be double what we pay now. That’s a combo of a better housing market plus paying for location. Thanks for sharing! I think you guys could totally build a Tiny House to accommodate height. . . I say go for it! Of course I might be a little biased. ;). There are so many amazing floor plans out there once you start digging. It’s also tough to know you have to pay more to live in a “safer” part of town. I have to say, the freedom to pick up and move makes those types of issues a little less problematic. Even if you don’t build a Tiny House on wheels, you might be able to cut back on “required” square feet to accommodate a different location in town. Obviously, so much depends on where you are. Good luck to you guys! Thank you so much for your kind words! It’s exciting and scary to be quoted ;). What a great story! It’s interesting to see how people in tinny homes make the transition and the shift they often go through to make it all possible. My home is not tinny by any stretch of the imagination at 1025 sq ft but I do try to keep it as minimalistic as possible. The only room in my home that is over run with “stuff” is the kids toy room. Which is always a work in progress for me. Tennille thanks for taking the time to comment. I think any home can be “tiny” if you adopt a more intentional mindset. It sounds like at just over 1,000 square feet you are already on a simple path, so congrats! Tiny living looks great to me, although I wouldn’t do it because I have kids. I don’t think there’s anything wrong with living a minimalist lifestyle! I bet that house is easy to clean! I love the concept of Tiny Living, but living in a pretty small apartment now, I long for the space to entertain. I want room for more experiences, not stuff. I want to be able to have friends and family over for dinners and board game nights. I feel like we can´t do that now because our apartment is so small, I´m sure I´d feel it even more so in a tiny house. What´s the solution? How do you have friends over? If entertaining is really important to you and you think you might go Tiny, then I would encourage you to get creative with the floor plan. There are a number of designs that have larger “open spaces” on the ground floor than mine. I chose counter space and closet space over floor space based on my lifestyle. I think you can find creative ways to entertain. I have chosen to meet friends out or at their houses when I want a large group get-together. I also use my outdoor space to entertain. I think outdoor living is a critical part of downsizing when you want to entertain larger groups of people. I scoured Pinterest for entertaining ideas in outdoor spaces. I hope that answer helped! Absolutely! I hadn´t considered entertaining outside. That´s a great idea! I have always loved the idea, I live in a 1100 sq ft house now with a storage basement. I would love to live in a 300 sq ft home. There is a grain bin converted into a tiny home around aAustin Tx, one can rent out on vacation, et that is a step I will try before getting serious et building one. Thank you for sharing! I love hearing about Tiny Houses. I’m not sure I’ll ever get there but myself, but I’ve been working on simplifying my life and just having less stuff in general. Swapping to an ereader has helped me save space on books. PS-That reading nook looks seriously cozy! I don’t think I’ll ever get there either Heather, but also have been working towards simplifying our life in general and feeling so much lighter and more free as a result! I love some of his stuff. 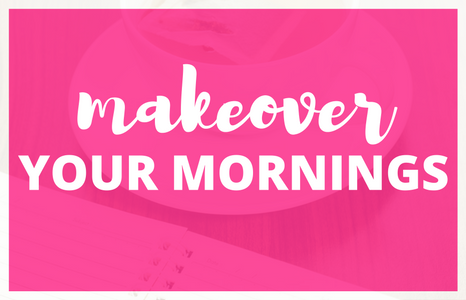 The Total Money Makeover really helped me put my money stuff in perspective. I also really enjoyed Smart Women Finish Rich by David Bach! So awesome! My boyfriend and I are actually remodeling a travel trailer (approx 220 sq. ft) and will be moving into full time at the end of August. It’s so fascinating and inspiring to read other ‘tiny housers’ stories and gives me solstice knowing it can be done. 😀 Thanks for sharing. Hi Lauren Jade! Congrats on your decision to downsize. There is a great community of people who are realizing less is sometimes more! I agree with everything you said in this interview. Your lifestyle choice is incredible, and the way I see it, especially after reading your words, affirms for me that it is the best way to live. Where do you recommend I go to get started on building a tiny house? The first thing I recommend to everyone is to do a lot of soul searching regarding whether this lifestyle will really work with your life goals and plans. Be intentional about the decision. 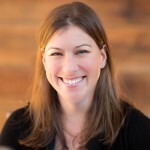 You can check out my blog at: tinyhouseteacher.com and I highly recommend Ryan Mitchell’s site: http://www.thetinylife.com. Hope that helps! Hi I am currently engaged and will be getting married next October. We don’t really want to rent because we think it is a waste of money but we also don’t won’t to buy. 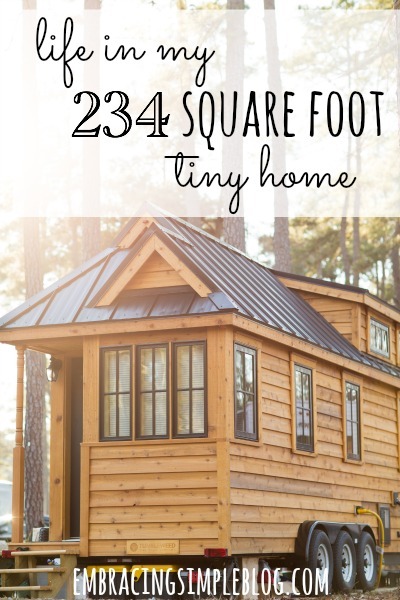 We have thought about a tiny home because it seems so perfect until we are financially stable to build a home. I had some questions on how does your plumbing work? Do you have a septic tank and how do you get water? First, congrats on the upcoming wedding! I am actually in an RV park, so I am hooked up to water and a septic tank just like any other RV. Basically I have a garden hose (RV rated, meaning safe to drink from) running into the house and a “sewer line” out of the house and into the parks septic system. Hope that helps! Shoot me an e-mail if you have additional questions. I have an obsession with tiny houses! I’m currently in a tiny studio apartment, which is cozy but totally do-able for me where I am in my life at the moment. I need to work on the “minimalist” part, but I seriously love the idea of having a tiny house someday. This really opened my eyes, so thank you so much for this post! Hi Kelsey, thank you so much for your feedback! I have really enjoyed the experience of living tiny. To be clear, I consider myself a downsizer rather than a true minimalist. It’s all about perspective I guess. I am in the Air Force, so the flexibility of taking my house with me makes it perfect! Good luck to you and stay in touch. Having lived in many different places in the U.S., I am somewhat puzzled where these tiny houses are going to reside. There are limited options for anything with wheels requiring utility connections. There are zoning restrictions in safe, pleasant areas about building a permanent tiny structure. Downsizing and getting rid of the mountains of stuff most of us are cumbered with is an attractive idea but I would do a great deal of research before going the tiny house route. Hello, did you have trouble finding legal parking for your tiny home? Is it easy to tie? Sorry I just read all the comments… around how much do you pay a month for the RV park?